Whether you are looking to play golf on world class courses, go whale watching or live like Jimmy Buffet you are certain to enjoy the unique nature of our villa, The Sea Dog Inn. Our all-inclusive private villa rental is located on the scenic north-east coast of the Dominican Republic. We offer the perfect combination of privacy, comfort and proximity to the enchanting Dominican town of Cabrera. The Seadog Inn is a truly beautiful tropical island setting offering its own small private beach, unique swimming pool and luxurious accommodations. 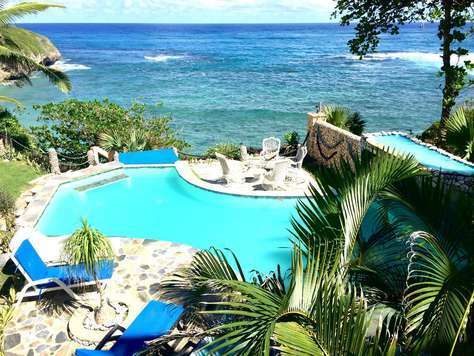 The Seadog is an airy 5 bedroom / 4 bathroom oceanfront vacation villa overlooking the Atlantic Ocean on a pristine cove. Our multilingual staff is there to assist you in every way you desire- from fully cooked gourmet Dominican Republic cuisine or complete privacy, your choice. At your request, we can provide live music with bachata dance lessons. Or if you prefer privacy, we can clear out the house and leave you alone to sunbathe and swim in our ocean view pool. Experience the beauty of this lovely villa and the community of Cabrera. The Seadog Inn is only an 8 minute drive along the coast to the Playa Grande Golf and Ocean Club golf courses. After a long day exploring, you will no doubt be hungry. We encourage you to try the local restaurants. Alongside their delectable food, you are sure to find a vibrant atmosphere. The Villa faces eastwardly to capture and allow you to enjoy the soothing trade winds and natural breezes of the Dominican Republic. To supplement the winds, The Seadog has air conditioning as well as ceiling & floor fans to keep you cool. Our patio bar (The Bone Bar) quickly becomes the gathering place at The Seadog. The bar features a frame made of humpback whale bones collected by local fishermen from the Atlantic Ocean as they washed ashore. Outdoor seating and lounging areas create the perfect space for cocktails, napping and reading. Enjoy the use of our private pool overlooking white sand beaches of the Dominican Republic. Dominican Republic vacation rentals don’t get any better than this. The secluded Dominican town of Cabrera has everything close by from waterfalls to a historic lighthouse or natural crystal clear lakes. The beaches are fabulous and plentiful! There are plenty of unique local bars and restaurants to add culture and local cuisine to your Dominican experience. We’ll supply you a guide or if you’re feeling adventurous enough, you can be your own. Our all inclusive villa is conveniently located within an hour and a half drive of Puerto Plata international airport. Adding to the remarkable traits of this property, starting in late January, the humpback whales are migrating to their mating grounds right in our own backyard. These magnificent creatures are visible to the naked eye as the splash their way along the coast. Drop us an email, it never hurts to inquire! Discover paradise, ‘Jimmy Buffett’ style at The SeaDog Inn! Write me personally for our August/July SPECIAL PRICE of $1,400 for up to 4 people.